Our mission is to engage with the residents of Belfast city and to change lives by creating access to sail training experiences and voyages for citizens of all abilities and backgrounds. increased learning mobility and employability. We currently run programmes which recognise that outdoor education and sail training can enhance the lives of young and older people regardless of their ability or background. As the civic leader, we have signed up to the Belfast Agenda with our key public, private, voluntary and community partners. Through the Belfast Agenda the Sail Training Program seeks to support and energise communities to become more confident and to ensure the development of transferable skills that can be applied to future employment opportunities. We will seek to tackle the ongoing challenges within neighbourhoods and ensure they are not left behind. In order to achieve this we will utilise the Belfast Employability and Skills Framework and the community service’s delivery model. Additionally we aim to promote inclusion and diversity and an acceptance of different backgrounds and abilities, improving and strengthening the collaboration between partner organisations and promoting people’s confidence and willingness to participate actively in society. Health and wellbeing is also a key theme to the sail training program with advice and practical workshops carried out on Tall Ship voyages. Join TS Maybe for a two day tall ship sailing experience. We head out of Belfast across the Irish Sea to the Isle of Man, along the South Coast of Ireland or across to Scotland, depending on the wind direction and weather conditions. This voyage is a great opportunity to gain experience sailing a traditional tall ship in the beautiful and rugged sailing area of the Irish Sea. A bursary is available for this voyage of £100, see link below of bursary and application. Join Tall Ship Maybe for a day sailing in Belfast Lough. You can take your turn at the helm, help to hoist the sails and gain some nautical skills, or if you choose, sit back, relax and take in the sea air! A bursary is available for this voyage of £85, see link below for details of bursary application. This voyage aboard the TS Pelican of London is the third running of “The Voyage” an initiative between the three cities of Dublin, Liverpool and Belfast which sees young people from each city taking part. The project is run with the support of Dublin Port Company, Dublin City Council, Liverpool City Council and Belfast City Council. The voyage will take place around the Irish Sea and may include visits to the three cities. This project is an Erasmus+ funded Youth Exchange voyage. Funding from our partners Sail Training Ireland through Erasmus+ has been secured, reducing the cost to £400 and a further bursary is available from Belfast City Council for this voyage of £200. See link below for details of bursary and application. Trainee pays £200. Funding from our partners Sail Training Ireland through Erasmus+ has been secured reducing the cost to £200 and a further bursary is available from Belfast City Council for this voyage of £100. See link below for details of bursary and application. Trainee pays £100. Following on from the hugely successful voyage in 2018 for Deaf and hearing impaired young people we are delighted to be running the voyage again in 2019. The Tall Ship Pelican of London will once again be the vessel for this adventure. As with last year aided communicators will be on-board to ensure that the young people get the most out of the experience. A bursary is available from Belfast City Council for this voyage of £300. See link below for details of bursary and application. Trainee pays £256. Take a long weekend break and turn it into an adventure and head to Oban to join the crew of TS Maybe to sail from Oban to Belfast to deliver her for the start of her Summer Youth Voyages in Belfast. 3 nights of fun and nonstop sailing (4th August - 6th August) on board a beautiful Tall Ship. A bursary is available from Belfast City Council for this voyage of £100. See link below for details of bursary and application. This voyage qualifies for Duke of Edinburgh Gold Residential. A bursary is available from Belfast City Council for this voyage of £200. See link below for details of bursary and application. While all efforts will be taken to accommodate a bursary for your chosen voyage, preference will be given to trainees who have not taken part on a Belfast city council bursary funded Sail Training Voyage. All trainees must reside within the Belfast City Council area to qualify for the bursary. Trainees must be within the age range of the voyage by the start date of the voyage. A bursary scheme form must be completed and confirmation email received by the applicant from Belfast City Council to guarantee successful application of the bursary. A bursary code will then be allocated to the applicant and must be sent to the voyage booking operator at time of booking, details for bookings will be issued via email from Belfast City Council. A ships booking form must be completed and confirmed by the ship or operator to Belfast City Council with fees being paid to confirm birth on ship. Details on how to book will be issued via email from Belfast City Council. If oversubscribed voyage allocations will be allocated on a first come first served provided all the above information has been received and confirmed by Belfast City Council. Belfast City Council bursary £100. Booking form and fee payment through Maybe sailing. Belfast City Council bursary £85. Booking form and fee payment through Maybe sailing. Belfast City Council bursary £200. Booking form and fee payment through Sail Training Ireland. Booking form and fee payment through Sail Training Ireland. Belfast City Council bursary £300.Booking form and fee payment through Sail Training Ireland. Belfast City Council bursary £100.Booking form and fee payment through Maybe sailing. Belfast City Council bursary £200.Booking form and fee payment through Maybe sailing. 86 citizens aged from 15 to 70+ took part in last year’s Tall Ships program with a total of 12 voyages totalling 66 days sailing on board the Tall Ships Atyla, Maybe, Pelican of London, Lord Nelson and the Classic ship Brian Ború . These voyages varied in length from 1 – 14 day voyages and visited ports and maritime festivals in Southampton, Coab, Belfast, Liverpool, Scotland, Gosport, Dublin, IOM and Cork. Here the young people gained invaluable skills and qualifications. These skills and qualifications help build young people’s development in community leadership and social and civic engagement through coaching and mentoring from the crew and youth mentors on board the ship to enable them to fulfil their potential. 10 Tall Ships Volunteers assisted the Community Development Officer (Sail Training) at various events throughout the 2018 program. Volunteers are key to the promotion of the Tall Ships sail training program and were based on the Tall Ship Maybe during the Maritime Festival. Volunteers were responsible for engaging with the public to promote the Sail Training programme and looking after the expression of interest sheets, our volunteers engaged and assisted with over 200 visitors. Further to this a tour of the Tall Ship Pelican of London was conducted by the skipper and assisted by 2 of our volunteers for 2 young persons and their families with specific needs. Local charity and RYA accredited Belfast Lough Sailability was selected to deliver this event supported by the sail training volunteers. 36 young people aged 11 – 15 of all abilities got the opportunity to gain basic knowledge in sailing a Hawk keel boat and a Ruffian 23 learning rigging, sail control and helm. The young people then joined the crew of the new multi-purpose rescue/motor boat Invincible to experience an educational cruse of the port of Belfast exploring the commercial side of the docks along with shipbuilding, titanic history and environmental awareness of bird and water life. To complete their experience they then took a tour on the SS Nomadic - tender to the Titanic and the last remaining White Star Line ship in the world! Restored to her original glory and back home in Belfast’s historic Hamilton Dock. All the young people then received a certificate of participation presented by Belfast City Council Tall ships volunteers. 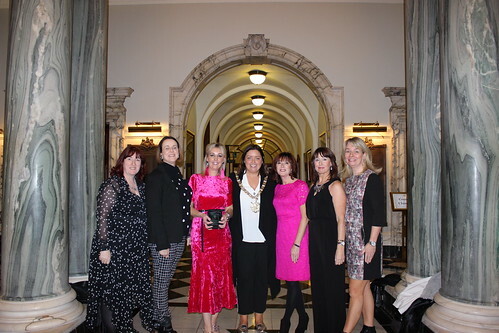 Belfast Lord Mayor Councillor Deidra Hargey hosted the 2018 Tall Ships Award on Friday 19 October at Belfast City Hall. A total of 75 participants along with parents, friends, community, voluntary and local partners celebrated the achievements of all who took part on a 2018 voyage. 36 participants completed their Tall Ships Trainee Crew Certificate and 6 completed their Erasmus+ youth pass certificate. Awards were presented to groups who completed specific themed voyages. All Ability voyage, Tall Ship Lord Nelson - 10 participants. Carers voyage, Tall Ship Maybe – 12 participants. Community and voluntary group day sail, Tall Ship Maybe – 12 from Lagan Dragons and 12 from Lagan Search and Rescue. Young lad Joel Baker from East Belfast picked up the special Maritime Young Supporters Award, Joel followed the Tall ships with his parents from the Belfast Maritime festive, to Liverpool and finishing off at Dublin’s festival over a 3 week period all the time promoting the Belfast Tall Ships Program. Individual awards were made to three young people who contributed above and beyond expectations to the Tall ships Program. Ryan Thompson, Tall Ships Trainee of the year. This gallery shows photos of trainees who received their certificates at the Sail Training program celebration event.